If you wanted the new REV-XS platform last season, you had to buy an X-Package sled in the spring or get the MX Z TNT 800. The good news for this year is Ski-Doo has expanded their REV-XS platform, so for 2014 the MX Z TNT with the 600 H.O. E-TEC engine package is on the new platform. The MX Z TNT models are the top in-season MX Z packages, making the combination of the XS platform and the 600 E-TEC engine about as good as we could hope for. This new look of the XS is more than just aggressive styling, it’s improved wind protection, more storage, easier serviceability, and the ability to get into a more aggressive cornering position for even better handling capability. Handling. This seems to be one characteristic so many sled makers like to claim as theirs and theirs alone. SnowTech test riders ride all of these new sleds each and every year, all year long, and we are here to tell you one of the core characteristics of an MX Z is the totally precise and predictable handling. No other sled delivers this same level of precision through the corners, and now with the XS platform you can take it to the next level by leaning forward even more if you would like for the ultimate in railing around the corners. Then we get to the rear suspension. The rMotion rear suspension is unmatched in its ability to deliver ride quality and comfort combined with big bump capability. The MX Z TNT gives you HPG Plus shocks all around, meaning they are Kayaba re-buildable high pressure gas shocks but without the external knobs or reservoirs. That means you get the best performance with simplicity. Other than maybe adding a gear bag on the back, this sled has it all. Electric start is now standard. Push-button electronic reverse (of course) is standard. A functional 15” tall windshield with hand protection is standard, no need to buy another before you are out the door. And the handlebars are straight aluminum with j-hooks, no corners cut here. Track? 1.25” lug height RipSaw. Skis? Dual keel, single runner Pilot 5.7 skis that rail around the corners with almost zero darting. Engine? 125 HP proven direct-injection E-TEC, and nobody else has an engine like this. Clean, quiet, sips fuel and oil, and it pulls (for a 600). What is the difference between the TNT and the X-package? The X-package gets adjustable rebound damping on the front shocks, and a KYB Pro 36 in the rear with an easy adjust knob, and also offered the (optional) Quick Adjust package for the rMotion. The X also gets a fancier gauge package, racing brake pads, lower windshield with handguards, and a taller (+15mm) riser block. But, you had to order the X-package in the spring to get one. The 2014 Ski-Doo MX Z TNT 600 E-TEC is clearly one of the most outstanding combinations of technology and performance ever offered. 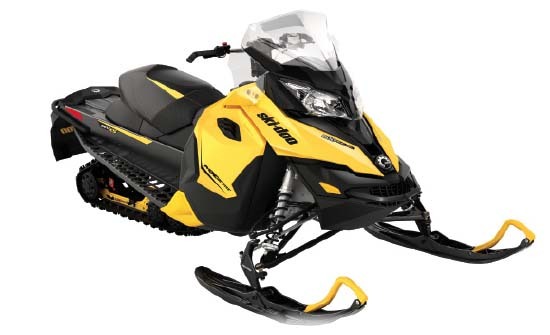 It retails for $10,849 and is available right now at your local Ski-Doo dealer.